Since last year the MSCI World index https://www.msci.com/world has increased from 1770 to 2070. 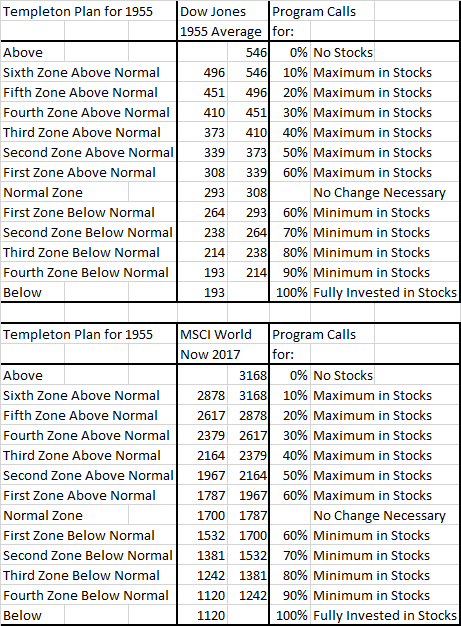 According to the adapted John Templeton re-balancing program I made last year, your percentage in stocks should decrease slightly from around 60% in stocks to roughly 55% in stocks. What will you do if stock prices go up or down? Sir John Templeton gave his customers a program, a plan before the year started: Today in 2016 he might have a higher percentage of stocks because interest rates (on (government) bonds) are currently near 0%.